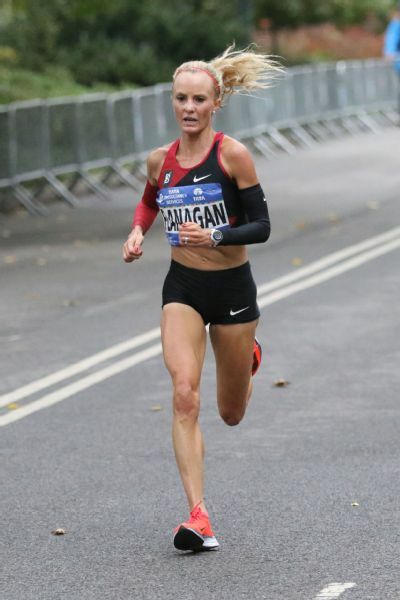 If Shalane Flanagan wasn't already America's sweetheart, she certainly became one last November when she won the New York City Marathon, breaking a 40-year dry spell for American women in that race. She's been to three Olympic games, won an Olympic medal in the 10,000-meters (a bronze, upgraded to silver last year after the silver medalist failed a retroactive doping test) and set American records in the indoor 3,000 and 5,000 as well as the 15-kilometer distance on the road. At 37, speculation about when Flanagan will retire is bubbling. She might have gone out with a bang after New York, but the Massachusetts native couldn't resist one more shot at the Boston Marathon in 2018 -- a race that would go down in history for it's miserable conditions and slow finish times. While she has said publicly that she's done with Boston, it certainly wasn't the race she would have hoped to go out on. On Monday, Flanagan said she will return to defend her New York City Marathon title in November. In the meantime, she's been continuing to expand her life outside of running -- including co-writing a second cookbook, out this month. Flanagan gave espnW a sneak peak of one of her favorite recipes from the book. Whose recipe: From my new cookbook with Elyse Kopecky, "Run Fast. Cook Fast. Eat slow." Preheat the oven to 375 degrees. In a large bowl, whisk together the eggs, yogurt, oregano and salt. Set aside. Heat the oil in a 10-inch to 12-inch oven-safe skillet over medium-high heat. Add the sausage and onion and cook, stirring occasionally, until they just begin to brown, about 5 minutes. Add the spinach and cook just until wilted. Remove skillet from heat. Pour the egg mixture over top and lightly stir to evenly spread out the spinach and sausage. Sprinkle the Parmesan on top. Back in the center of the oven for 25 minutes or until the eggs have set and the top is golden. Slice and serve!